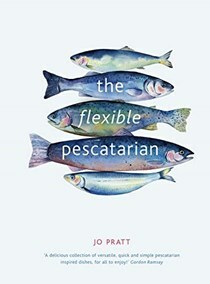 We are pleased to share a promotion for our next EYBD Book, The Flexible Pescatarian by Jo Pratt. I love the "flexibility" of these recipes covering all palates. Our recipe shares below reflect how the author provides variations for many of the dishes. A bonus is the range of international recipes that span the globe and are all simple, well-balanced and packed with flavour. The author provides approaches on how to cook your fish and hacks for vegetarian options, this original cookbook shows you how to prepare the perfect fish fillet and handle whole fish and seafood. If you order this title before our promotional period ends, register here (be sure you have a photo of your receipt or screenshot from your online order ready to upload). Once your purchase has been verified, this button will appear on the book on your Bookshelf next to the title and will take you to the digital access for this book. The publisher is offering two copies of this book to EYB Members in the US and Canada. One of the entry options is to answer the following question in the comments section of this blog post. Please note that you must be logged into the Rafflecopter contest before posting or your entry won't be counted. For more information on this process, please see our step-by-step help post. Be sure to check your spam filters to receive our email notifications. Prizes can take up to 6 weeks to arrive from the publishers. If you are not already a Member, you can join at no cost. The contest ends at midnight on May 9th, 2019. Seafood Scotch egg. I always wanted to taste a Scotch egg when I ate meat. Spicy coconut prawns, my sister-in-law used to make the best ones, I have never mastered them. Ceviche with avocado salsa! I love all ceviche. Baked sardines with capers, raisins and preserved lemon! Salt cod croquetas with jalapeño and lime mayonnaise! The Cornish cheese pasties sound tasty! I would like to make the chilli-baked feta with watermelon salad. Think I'd try the Vietnamese BBQ salmon first!